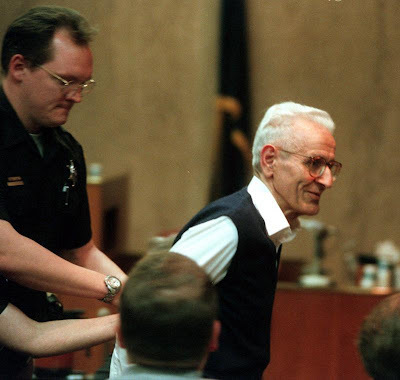 The murderer Jack Kevorkian was imprisoned for lethally injecting Thomas Youk, who had Lou Gehrig’s disease. He was prosecuted because, egotist that he is, he video taped himself doing it and brought it to euthanasia fan Mike Wallace for airing on 60 Minutes. That was even too much for the Oakland County, MI prosecutor, who had won office on a plank of letting Kevorkian be Kevorkian–not knowing just how depraved K could be, as in taking kidneys from Joseph Tushkowski after an assisted suicide and offering them at a news conference. Plus, there was Kevorkian’s obsession with human vivisection, but I won’t replay the entire litany here. If you want more details, hit this link. KEVORKIAN: I did the injection [of Youk]. KING: Usually they kill themselves, right? So, that was not pure suicide. KEVORKIAN: No. I did the first one too, [Janet] Adkins, the first case. After that, we had the method where the patient could trigger it themselves. Adkins had early Alzheimer’s disease, meaning she had many years left of life, and in fact, played tennis with her sons a few days before her apparent murder. So, Kevorkian has admitted he’s a repeat murderer. Technically, since there is no statute of limitations for murder, he could be prosecuted for Atkins’ homicide. Instead, he’ll keep getting high level interviews, movies made about him starring Al Pacino, and $50,000 speaking fees at state funded universities. We sure do have a twisted love for outlaws in this country.